It’s always nice to receive good news, isn’t it? A Twitter account calling itself “The Library Haunter” last month supplied some great news (shown here) for those of us who are appreciative of and dedicated to literacy, but especially book literacy. 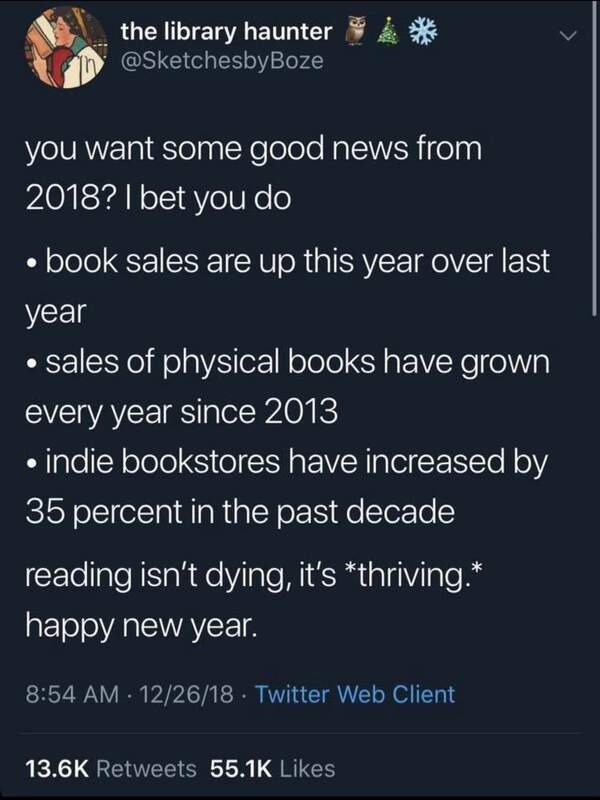 Sales of physical books have grown every year since 2013! This one is also a twofer. Though rightfully celebrating the growth in reading of printed books, the Library Hunter didn’t mention digital books. One might expect that their sales are going up every year as well, certainly since the launching of Kindle by Amazon and Google Books. Indie bookstores have increased by 35 percent in the past decade! Now THAT was a shock and a true smile enhancer for me, since some of my fondest memories of youth were visiting used and old book stores in and around Kansas City. The smell of a warehouse of old books still causes flutters in my heart. 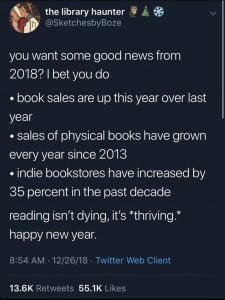 Reading isn’t dying, it’s “thriving!” Sadly, the commonly held impression that bound media is dead or dying suggests that we all need to read better sourced material. What’s the WHY for each of these? 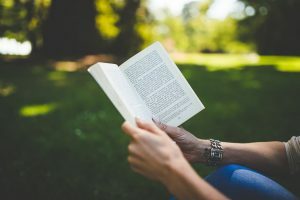 Reading anything can be a positive influence on lives, but like other media, there are those engagements that are, well, engaging, but without necessarily adding much positive to the life of the reader. Books on the other hand, can present a complex and compelling tale or artfully elucidate an attention getting topic. Reading books has an undeniable benefit of providing the reader with significant amounts of relatively sophisticated language with each enriching encounter. This last matter alone is what makes book reading the most positive choice that children can make. Book reading provides the most powerful input of carefully composed language that engenders powerful language with which readers can think and express themselves. The Library Haunter presents (at least with the Tweet noted here) good news about books and books alone. That choice of focus was brilliant. Even newspapers, as important as they are, change daily, fulfilling a very different mission that typically includes a local, here and now focus, and simple Tweetings like this one seek to share just one or two things for us to consider. Focusing a quick, simple Tweet on this most advanced and elaborate form of print conveys in a message format non-book readers can understand, that they should always consider themselves invited to this expanding party. ← One Language or Two? More is Better.